Meet five HIM professionals who are helping to reshape the profession. Rising stars and seasoned veterans alike are making a difference in the HIM arena, where a wide range of issues—each with its own set of challenges—has been changing the landscape. This set of profiles introduces readers to a group of “movers and shakers” who are doing their best to catapult HIM into a new era. Glass has been in the thick of HIM since 1983, having done everything from coding and transcription to teaching. “I’ve seen the evolution from when we did everything manually to now having electronic medical records,” she says. At Houston’s St. Luke’s Episcopal Hospital since 1999, Glass first worked on the planning and implementation of its document imaging system, the initial step toward what would be one of her biggest projects: instituting remote coding as part of creating a flexible workplace environment. “We had a lot of experienced coders, and the demand for these individuals is high. Our administration was supportive of the change, and we were committed to making remote coding work,” says Glass, who is the assistant HIM director at St. Luke’s. Planning such an undertaking took collaboration among various hospital departments. The most critical aspect, according to Glass, was working with HIM to ensure that the preparation, scanning, and quality review processes were well staffed. A multidisciplinary team hammered out the details of hardware, software, creating a working agreement for the remote employees, and more. In 2003, St. Luke’s began sending coders home to work one at a time, beginning with the outpatient coders. From the employee side, advantages abound. “It’s so much more than simply avoiding traffic and parking issues for them. They have a much better work/life balance; there is less absenteeism; there is no interruption of service for weather emergencies. We know it is working because we received high employee satisfaction scores in Gallup surveys,” Glass says. For facilities looking to adopt remote coding, Glass has a couple suggestions. “I can’t stress enough how important it is for the scanning, prep, and quality review to be well staffed. If this area is lacking, then the process won’t run smoothly. And I would also recommend having as many documents bar coded as possible, which also adds to the efficiency,” she says. In addition to her work at St. Luke’s, Glass coordinates coding roundtables for the AHIMA’s Texas chapter, which provides sessions specific to coding at the regional and state levels. “Coding roundtables offer low-cost coding education. Sometimes facilities can’t always pay for training, so this fills that need by offering coding-specific educational seminars at a reasonable cost,” she says. Last year’s recipient of the AHIMA’s prestigious Rising Star award, Melvin is the senior business systems analyst at St. Luke’s Hospital in Chesterfield, Mo. A 2003 graduate of St. Louis University, Melvin, who began her HIM career as a project manager in a physician’s office, accepted St. Luke’s offer to become manager of its document imaging center in November 2003. She jumped into the thick of things during the January 2004 go-live of the hospital’s document imaging system, a huge undertaking involving coordinating the document setup process that would take St. Luke’s from paper to an electronic system. In 2005, Melvin moved to her current position—which she describes as “right up her alley”—where she is able to use her degree in HIM with a certificate in management information systems. “I have always enjoyed technology and the technical aspects of HIM, so the opportunity to act as a liaison between HIM and information services is fantastic,” she says. Melvin was also heavily involved in the facility’s implementation of its clinical documentation system. In the planning phase, she worked with practitioners in various departments to learn what features they liked, what they wanted to change, and what they could do to implement a system that would meet the facility’s requirements and improve workflow. “At the onset, we had 1,500 paper forms that needed to be accounted for in the electronic environment. It’s still an ongoing process because there are always requests to improve documentation methods, plus there are upgrades and regular maintenance windows to deal with,” she says. Melvin also uses her HIM skills when called upon to evaluate new clinical systems, such as e-signature. She explains that oftentimes the product offered by a vendor may not meet regulatory or facility requirements, making it essential to address these issues before contracts are signed. “I appreciate that the information systems department respects my role and consults me in these situations,” she says. “I really enjoy my career, and the environment at St. Luke’s is one that fosters my passion for it. I am fortunate to work in a hospital that enables me to grow professionally and encourages me to be both technically competent and creative,” adds Melvin, who is currently working on automating reports and eliminating manual processes, which will save time and improve patient care. Outside of St. Luke’s, Melvin serves as president-elect for the Missouri Health Information Management Association. “It’s an exciting time to be in a leadership role at the state level and, in this capacity, I am able to help drive the educational and strategic efforts of our organization,” she says. One of the major tasks facing Melvin and the organization is supporting the Missouri Health Information Exchange initiative. As president of CardiologyCoder.com, Collins directs the firm’s auditing, training, editing, and advocacy efforts. He has been dedicated to compliance and revenue enhancement for physician practices for 15 years, during the last 10 of which he has focused exclusively on the unique challenges and opportunities presented to cardiology practices. “The medical coding and reimbursement paradigm is far more complex, and far less logical, than the current tax code. The fact that the government is dedicating $1.5 billion this year to auditing and prosecuting healthcare fraud in addition to the recent nationwide expansion of the Recovery Audit Contractor program has created a tremendous amount of anxiety among physicians and coders,” Collins says. 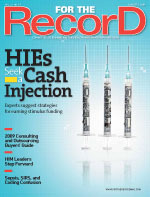 At the same time, he adds, physicians are being inundated with an acute need to comply with an impossible set of coding rules as reimbursement rates tumble. For example, echocardiography reimbursement, the largest source of revenue for many cardiology groups, was unexpectedly reduced by more than 35% on January 1. Meanwhile, costs associated with operating practices steadily increase. Subsequently, Collins has dedicated himself as a cardiologist’s advocate. “I focus all my efforts like a laser beam on the coding, documentation, and reimbursement challenges that practicing cardiologists must conquer if they want to operate a profitable business,” he says. Collins says it is critical that staff produce claims that are accurate and supported by available medical documentation. When payers identify inaccurate claims, they typically demand refunds of inappropriately reimbursed money and often assess penalties that can range from three times the inappropriately billed amount up to $15,000 per claim. Some of Collins’ clients seek litigation support after they become the target of an audit, while others ask for advice to proactively reduce liability. He tells them that “100% compliance is not a realistic goal; you simply can’t achieve it.” Instead, he recommends that practices have periodic audits conducted at least annually and that physicians focus on the top three or four areas identified as being off the mark. Over the course of a few audit cycles, a marked improvement can be achieved. Collins also offers online educational opportunities. “Coders need to know anatomy, physiology, the complex code structure, and they must be able to accurately decipher operative reports,” he says. His advice to cardiology practices? “Fuel the revolution.” He believes coding and reimbursement rules are so unfair that practices need to demand change from Medicare and their specialty societies. “When I deal with officials at Medicare, I often hear that I’m the only person complaining about these injustices. Physicians need to stop being wimpy and complacent. They need to fight these injustices,” he says. Besides sporting an impressive string of credentials, Grider is vice president of strategic development for the American Academy of Professional Coders (AAPC), an accomplished author, and an acknowledged medical coding expert with 30 years of experience who is currently responsible for the development of the AAPC’s training and curriculum for ICD-10-CM. In that role, Grider authored the ICD-10-CM Implementation Guide for the American Medical Association. “I’ve been working on ICD-10 issues for the last four to five years in preparation. As the vice president of strategic development, I’m developing the AAPC training plan focused on the provider and payer markets,” she says. “We are developing a robust curriculum and, in July, we [launched] three free Webinars that will serve as a guide as to where to begin in planning for the ICD-10 implementation. We developed these Webinars based on a lot of feedback from providers indicating that they don’t know where to start. It’s not as simple as just learning the ICD-10 code set; [it] involves many issues that need budgeting.” The Webinars are geared toward all types of providers, including those in small to medium practices. Under Grider’s leadership, the AAPC will steadily increase its ICD-10 educational sessions as the 2013 deadline for implementation approaches, including five sessions scheduled for this year and eight regional conferences in 2013. “Another task is a project to ‘train the trainers,’ where we are utilizing a core group of expert instructors who will train our members, providers, and health plans on ICD-10 so that we are delivering exactly the same material, curriculum, and message on behalf of the AAPC,” Grider says. Developing a comprehensive strategy for ICD-10 implementation training is no small feat. The process took much preparation, with Grider and her team taking three months just to develop an action plan. She notes that the biggest challenge is not necessarily on the hospital or payer side but in getting small to medium-sized provider organizations to begin planning immediately. “A lot of them aren’t dealing with it. Many of them are resistant, but they can’t delay because it’s the law. The CMS leaders are saying there will be no delay, no pushback of the implementation because they are moving forward,” says Grider. To help allay this challenge, the AAPC is reaching out not just to coders, attorneys, and consultants but also to physicians. “They have so much to prepare for: changing their systems and software, looking at health plans’ policies, preparing for the appropriate levels of training for themselves and their staff. The most important thing to do is get your practice ready for implementation,” says Grider. One mistake that providers can make is training on the new code set now. “If they train in 2009, they will forget much of what they learned by 2013, and codes and guidelines will be revised, so they’d be wasting their money in pushing forward with training at this time,” Grider says. Instead, she recommends developing implementation plans based on a systematic approach. “One thing we have available for our members on the AAPC Web site is a set of implementation guidelines in a ‘stop-and-go’ type of format that gives the steps to implementation and allows you to check them off systematically,” Grider says. The pace of implementation is also measured; for example, a yellow light indicates the provider is taking too long to complete a particular step. As the interim chair/instructor in the HIM department at Alabama State University, Smith tells her students that “an ice cream social changed my life.” It was in that setting that she was introduced to the school’s HIM program, a happenstance that changed her career path. “Previously, I was majoring in another allied health field, but I realized it wasn’t for me. I really knew I wanted to make a difference in the healthcare arena without having to be involved in direct patient care. Once I was introduced to HIM, I explored the field, did some volunteering, and found that I loved working with the data and information,” she recalls. A firm believer in education, Smith never tires of all that HIM has to offer. As a teacher, she provides instruction on everything from medical terminology and CPT coding to foundation building and data communications with an EHR concentration. “There is nothing I don’t focus on,” she notes. She enjoys HIM’s research component, quality improvement, and healthcare statistics. “I love to show my students that they have to open their minds to the day-to-day issues that affect healthcare operations,” says Smith. Others have noticed Smith’s passion for her work. In fact, a colleague, Lakesha Kinnerson, MPH, RHIA, nominated Smith for the AHIMA’s 2009 Rising Star Award, saying Smith embodies the spirit of HIM. “LaShunda received her credentials less than seven years ago, but her accomplishments would allow one to think that it has been a longer period of time. LaShunda has served the HIM community as a journal contributor, researcher, educator, and volunteer. She is highly motivated, and her top priority is educating future leaders of tomorrow,” says Kinnerson. She adds that Smith is never one to shy away from a challenge, pointing out that she accepted the role as interim program director while maintaining a full teaching load and taking classes herself in a doctoral program. “She strives to attain all of the knowledge she can to impart to her students and her community and demonstrates excellence in the management of her staff, projects, and volunteer assignments,” says Kinnerson.